VietNamNet Bridge – Chairman Nguyen Duc Kien of Hoa Phat Hanoi and Hanoi ACB football clubs have decided to establish the Hanoi and Hanoi Young Football clubs. Coach Nguyen Thanh Vinh of the newly-established FC. After purchasing Hoa Phat Hanoi FC, Kien has merged it into the Hanoi ACB FC. 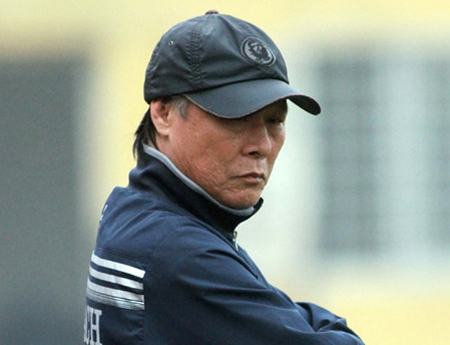 He has selected the best players from the FC to set up the Hanoi FC, which will play at the V-League 2012. The team’s coach is Nguyen Thanh Vinh and its captain is Thanh Luong, the Golden Ball Award 2009 winner. The new club also has outstanding faces, such as Timothy, Minh Duc, Thanh Trung and especially Vietnam’s top striker, Le Cong Vinh, who has just joined the team. Hoa Phat Hanoi FC will contribute 17 players and all of its coaching board to the new club. Hanoi ACB will contribute 9 players. The remaining players will go to the Hanoi Young Football FC. With the new FC, Kien delivered a message to fans of the two former FCs of his aspiration to pursue the tradition of the original club – Hanoi Police – to build a contingent of football player who come from different locations but the team will preserve the nature of “Hanoi’s football”.